FUEL ANTI-GEL | Pro Chem, Inc.
FUEL ANTI-GEL is an additive for diesel fuels and all grades of heating fuel oils. This concentrated antigel reduces the pour point by as much as 25°F to keep fuel flowing to engines and boilers in cold weather. It also modifies the shape and structure of wax crystals as they form in the cold oil, preventing the clogging of lines and filters. 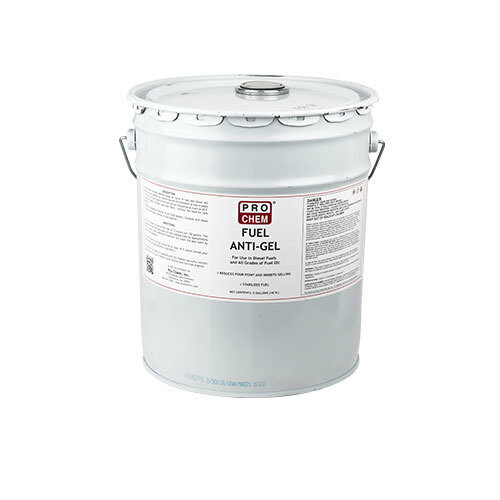 FUEL ANTI-GEL eliminates dangerous failures of oil-fired boilers, furnaces, diesel trucks and generator engines in cold weather. Add 12 ounces to 150 gallons of all grades of fuel. This dosage will lower the pour point of most residual fuels by approximately 20°F. In some cases, additional treatment will lower the pour point by several more degrees. For best results, the fuel should be at least 10°F above normal pour point when antigel additive is blended in. This diesel additive complies with the Federal low sulfur content requirements for use in diesel motor vehicles and non-road engines. Caution: Combustible. Harmful or fatal if swallowed. Keep away from heat or open flame. Keep out of reach of children.